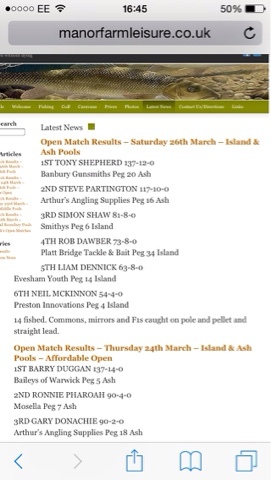 Liam Dennick Fishing : Saturday 26th March. Day 1 of my 3 day weekend saw me heading to manor farm for the open match. 14 fishing. With Ash pool and island pool in. 5 on ash. 9 on island. I knew you needed to be on ash pool to win but islands always worth some bites and fishing for the lake win. 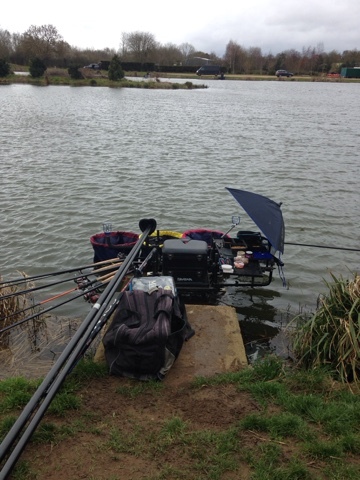 In the draw bag and out came peg 14 island. It can be a good area but the favoured pegs are 4 + 6 and with these being in my section I needed a miracle. 4 rods - 3 feeder and 1 waggler. 1 pole rig - for my Colmic F33 to fish 8m down the edge to the next pallet. As I was setting up it was noticeable that the wind was getting stronger and stronger and by just 10 o'clock it was somewhere near 30Mph and getting stronger! The all in soon came and I started on my Next Adventure 45 rod at around 30 turns fishing popped up bread. 3 casts in about 20 minutes saw me biteless. So picked up my Next Adventure 60 rod (a bit more powerful) with a 24g guru pellet feeder. Fishing a 6mm pellet on the band and dampened micros inside. I launched this to the island landing just inches off and sat for a bite... I waited 20 minutes and nothing happened and was clear that the fish were shorter as I started getting some line bites. So I wound back in and chucked it 35 turns and clipped up here. Minutes later the rod wrapped round and a rather welcome 3lb F1 was in the net, and with no one really catching I felt this was ok. The next hour was great, I stayed on this line and kept chucking every 10 minutes and by 2:00 I managed to put 13 F1s and 3 Carp in net. It didn't! I waited for 10 minutes before that rig was back up the bank and picked up my pellet feeder rod for the last hour of the match. As it was going iffy I started to chase fish so chucked a little further and waited... This resulted in another chunky F1. I didn't feel this was getting me anywhere so decided to spend the last half an hour fishing tight to the island. At 3:25 the tipped dropped back and small mirror carp was in the net just before the all out. 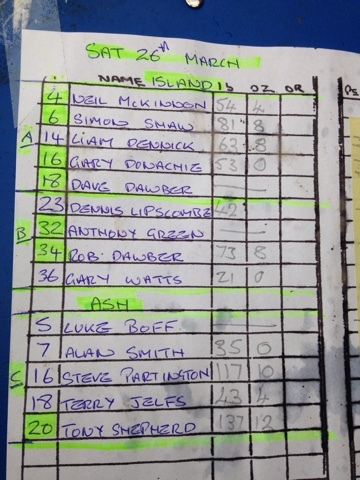 My 14F1s and 4 carp went 63-4-0 putting me 5th overall and 3rd on the lake. I really enjoyed the match and was nice to just fish a rod for a change.